Not everyone can read all of the fantastic books by authors who give us tips to grow our businesses, but host, Susan Finch, made time for Matt Heinz's book, "Modern Marketers Field Guide" recently. If you haven't read it yet, it's a great book to chunk out into actionable items by category: Email, Tradeshows, Website, Direct Mail and more. Matt Joins Susan to talk about who best benefits from this book as well as a sneak peak as his latest book, "Full Funnel Marketing." This is a short episode, so no excuses for you to listen in. If you listen to this episode you will also learn that Matt is a TERRIBLE bookseller and will tell you how to get both books free. Learn in this episode about determining what is URGENT vs. what is IMPORTANT. If you haven't had a chance to dive into all that Matt and Heinz Marketing offers, get to know him. He's not only a quality and successful person, but he shares tips constantly to help you grow your business. 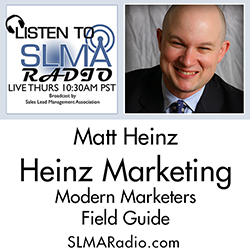 Matt is a prolific author and nationally recognized, award-winning blogger, Matt Heinz is President and Founder of Heinz Marketing with 15 years of marketing, business development and sales experience from a variety of organizations and industries. He is a dynamic speaker, memorable not only for his keen insight and humor, but his actionable and motivating takeaways. Matt's career focuses on consistently delivering measurable results with greater sales, revenue growth, product success and customer loyalty. Matt is a repeat winner of Top 50 Most Influential People in Sales Lead Management and Top 50 Sales & Marketing Influencers. Matt is living through the renovation of a 105-year old historic farmhouse in Kirkland, Washington with his wife, Beth and three young children. You can read more from Matt on his blog, Matt on Marketingfollow him on Twitter, or check out his books (listed below) on Amazon.com. Sales Pipeline Radio - weekly on the SLMALive network at 11:30 am Pacific.